WOW – who would have thought that an old car stereo like mine could be brought back to life with an FM transmitter gadget like this for around £12 ($16) or thereabouts. My problem is that I don’t want to get rid of my old car, it is an MR2 Roadster convertible on a W plate and whilst it is now around 15 years old, it gets through its MOT each year and only has 47,000 miles on the clock. I am sure there are many other car stereo owners out there who have found themselves in a similar position, and this is it. Many older stereo systems built before the invention, or proliferation at least of smartphones, have no mechanism for accepting input from the newer devices, which have outputs such as Bluetooth and your standard headphone jacks. With hugely greedy companies now restricting your storage method to an online service (such as google play music), many of us have begun to find it difficult to play our music collection in our cars. Whilst my stereo is a great make, has great sound and top quality speakers, there was simply no way to “feed it” as such from my smartphone. It only has a tape deck (and lets face it – NOONE uses those anymore) a Radio and a CD player. The CD player skips bits of the tracks as the car goes over bumps in the roads, and this is infuriating to say the least, and as I mentioned, tapes? Forget it. 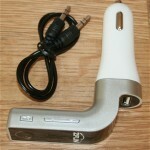 Then, along comes this FM transmitter by a manufacturer called ZFLIN and it is the solution to all of my musical needs! How to connect the FM Transmitter to your Car. 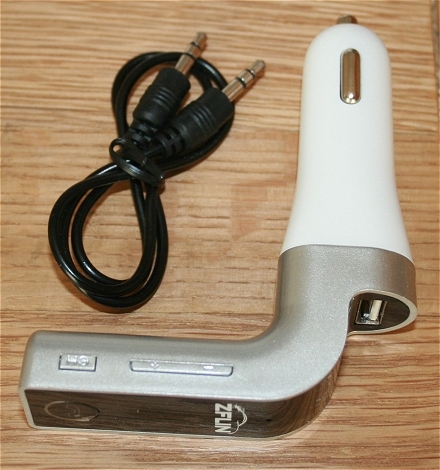 To get up and running with your favourite tunes on your smartphone playing back on your car stereo, you simply connect the FM transmitter into the cigar lighter socket or spare 12v power outlet of the same socket type which some cars now have. Then, you power on the cars engine. The method I use is to connect a cable from my smartphone headphone socket directly into a line-in socket on the side of the transmitter. At this stage, with the engine running, the transmitter will show (in LED) on the top, the current frequency at which it is transmitting it’s input. Now, the input could be a phone call (the callers voice) or your music. In my case its music. All you have to do, is set your car stereo to be in Radio mode, and instead of listening to the drivel which normally comes out of it (ads and all), tune one of the channels into the frequency displayed on the transmitter. In my case it’s default was 1008.00 FM. Once this is done, use your phone app (such as google play music for example) to load up your playlist, select a test tune to play and start it playing. You may need to adjust the volume on your phone, the transmitter and your stereo at this stage. 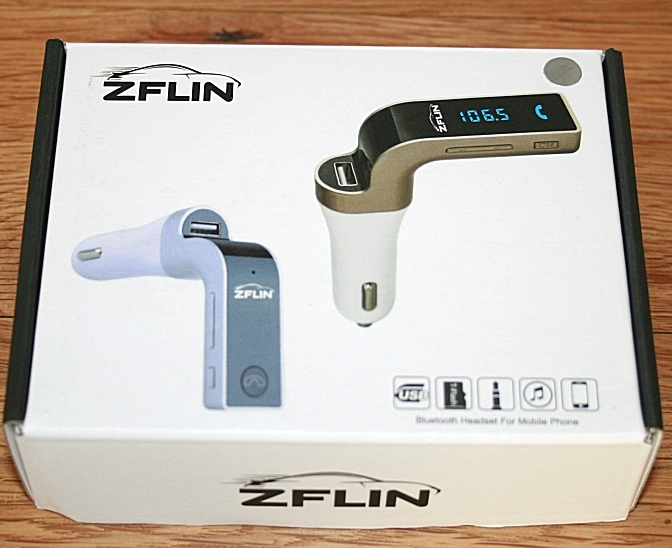 If your phone is connected to the ZFLIN transmitter correctly either via bluetooth pairing or a cable, the sound will be sent from the transmitter to your car ariel, and in-turn into your stereo and out of your vehicle speakers!!! This sounds a little complicated – but it really isn’t, I had music blasting out at full volume with perfect clarity within 30 seconds of opening the box! It also comes with a cable, accepts SD cards if you have music files still which arent ringfenced by the large corps, and also does hands free communications should you desire. There is also a USB port on it – but I haven’t actually used this yet. I love this FM transmitter as it has brought both my car and it’s aged stereo back to life – there are naturally no more issues with going over potholes and skipping parts of the music. You can save yourself a fortune by getting one of these instead of getting an upto date stereo and having to have a professional installer fit it for you, and if you are short on power sockets – just get a splitter like the one we have shown in our other review. Thats the one I use and its absolutely fine running two car cameras aswell as this. Instructions for using the device are in the form of a small leaflet, which clearly demonstrates how to connect and use the features in a clear and concise manner. - Revive your old car stereo! - No Cons - this is brilliant.